Fried food is a guilty pleasure for almost everyone. Whenever in doubt about a food, fry em and it will never disappoint. Frying food is a traditional thing in all cultures and has been used as a popular cooking method for centuries. Out of the different frying methods, deep frying and air frying are the most popular. So, naturally deep fat fryer vs airfryer is a popular debate. Whereas foods fried with deep fryers have their own values in terms of taste, air fried foods are generally healthier. So, which one is better? Stay with us for a comprehensive guide on air fryer vs deep fryer. You can prepare tasty foods like french fries, fried chicken or even an entire turkey. This fryer uses preheated oil for flash cooking. You have to put your food in the deep fryer basket and then submerge the basket in the preheated oil. Since the food is soaked in hot oil, it gets cooked on all sides equally. Deep frying doesn’t require as much time as other frying methods such as pan frying or air frying. Deep frying has Maillard effect on food. This means that deep frying decomposes the sugar and protein content of the food and gives the surface a golden brown color. On the other hand, air fryers cook food with air. The air is superheated. There’s a fan in the device that passes air through an element that causes heat. Then, the hot air comes in touch with the food in the basket. The air fryer also cooks the food equally on all sides and thus has the same Maillard effect as a deep fryer. This gives the food a crisp texture on the outside. A deep fryer requires more oil than an air fryer. However, if you maintain your deep fryer properly and clean it regularly, the amount of oil consumed can be significantly reduced. Air fryers are just deep fat fryer with low oil usage. Foods made in an air fryer are a lot healthier than in a deep fryer. For example: if you make French fries in an air fryer, you’ll get 80% less fat than frying potatoes in a deep fryer. So, using an air fryer is great for those who are concerned about getting fat. At this point of the airfryer vs deep fryer debate, air fryer wins. Due to deep fryers’ faster heat transfer in the oil, they can cook a lot faster than the air fryers. You can practically cook any amount of food in a deep fryer. It has small and large cooking baskets for this purpose. But air fryers have limited space for cooking food, so you can only cook food in small amount in this device. You can get a large air fryer with a little more budget. 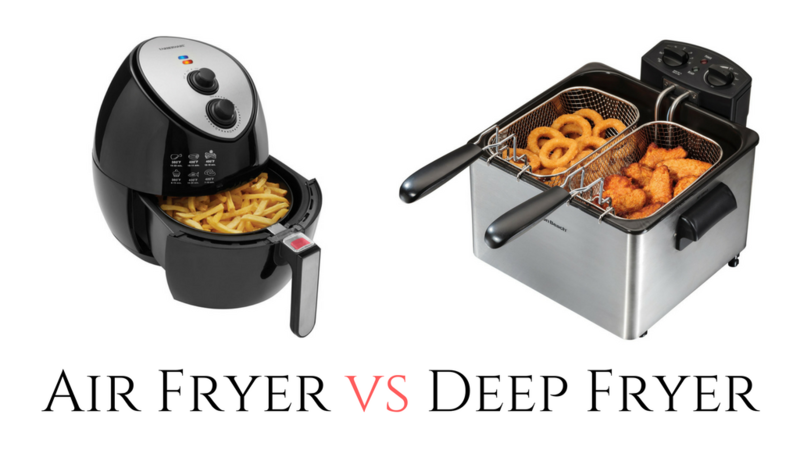 If we’re talking about air fryer vs deep fryer taste, deep fryer produces tastier foods among the two fryers. This happens because the foods made in a deep fryer are generally crunchier than in an air fryer. Cook time significantly affects the taste of food. For example, time required to make perfect crispy chicken fries in a deep fryer is significantly less than that of air fryer. If the chicken is cooked with enough time in air fryer, similar crisp like deep fryer can be achieved. You can use batter on the deep fried foods but if you put wet batter on the food and put it in an air fryer, it won’t turn out well. The hot air in the air fryer blows the batter away from the food. You can use extra oil spray for a crispier taste in the air fried foods but even then, the crisp doesn’t match the crunch produced in a deep fryer. It’s not advisable that everyone uses a deep fryer. Deep fryer has several risks. The hot oil can scald your skin. There are even cases of fire breakout during deep frying. Air fryer, on the other hand, doesn’t involve any of these risks. Since the air fryer has a lid, there’s no chance of getting burnt while using this machine. You can also set the temperature and the timer in an air fryer, so your food is never likely to get burnt. Air fryer costs a lot compared to the deep fryers. Anyone can get an air fryer for him/herself since it starts at $50 and even the expensive ones cost around $200. But even the simplest air fryer costs $100. But air fryers can not only fry but also roast, bake and grill. So, you’re capable of using the device outside of simply frying foods. Also, the cost of the oil used for frying needs to be taken into account. Whereas deep fryer requires a lot of oil for a single fry, an air fryer hardly requires any oil. With an air fryer, you can cut down the regular oil cost of frying. If you’re thinking about long term usage, getting an air fryer is more economical. You can only prepare a couple of dishes in a deep fryer since you’re only able to fry foods with it. But with an air fryer, you get to bake, roast and grill besides frying. This, too, puts air fryers over deep fryers. At this point of our air fryer vs deep fryer discussion, we’ll point out the benefits and drawbacks of both. If you’ve followed us so far, you already know about the difference between deep fryers and air fryers and which one of the two fryers you should go for. But let us point that out for one last time. If you want a fryer for the taste of fried foods, choose a deep fryer. An air fryer can be almost as good but the taste provided by the deep fryer is on a different plane. If you’re concerned about your health and want to maintain a healthy lifestyle, an air fryer is your choice. The amount of fat and calorie content in the air-dried foods are almost nothing to the deep-fried foods. If you’re thinking about budget, a deep fryer is your friend. However, if you think about the long term use, you’ll find that getting an air-fryer is more cost-friendly. An air fryer saves on the cost of oil whereas a deep fryer requires a lot of oil. The air fryer is a great successor to the deep fryer. If you want to get the best out of your fried foods and with the minimum budget, go for a deep fryer. But if you want to do a lot more than just fry foods, go for an air fryer. Your choice mainly depends on your needs. 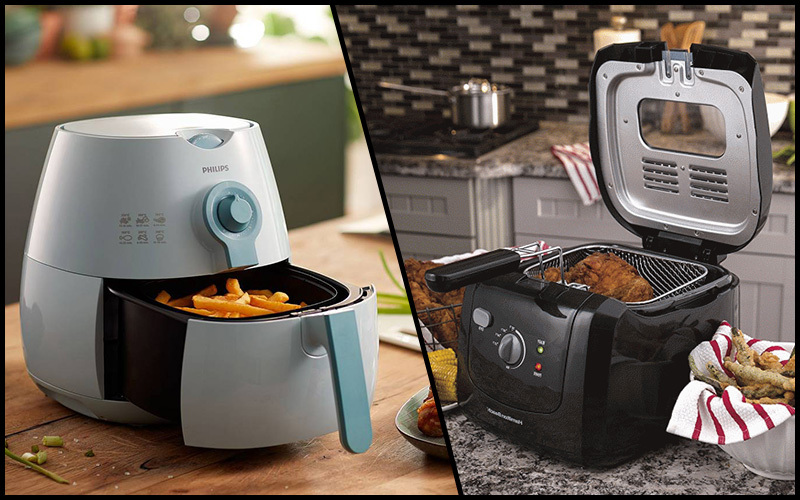 Our air fryer vs deep fryer discussion provides a comprehensive study on both machines, so you can select the best fryer for your home.